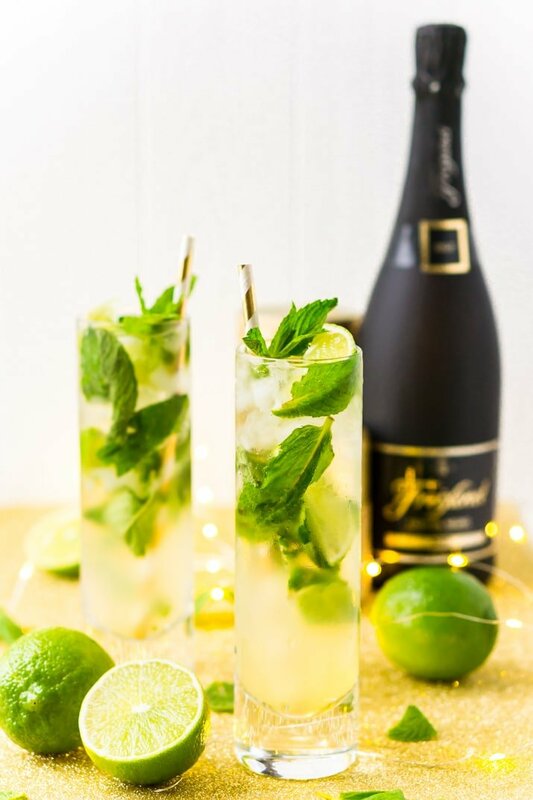 This Champagne Mojito Recipe is a bubbly twist on the classic cocktail making it perfect for parties and celebrations. 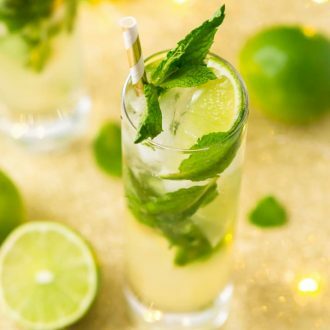 Made with fresh limes, mint, simple syrup, rum, and champagne, everyone will love this zesty and refreshing cocktail! 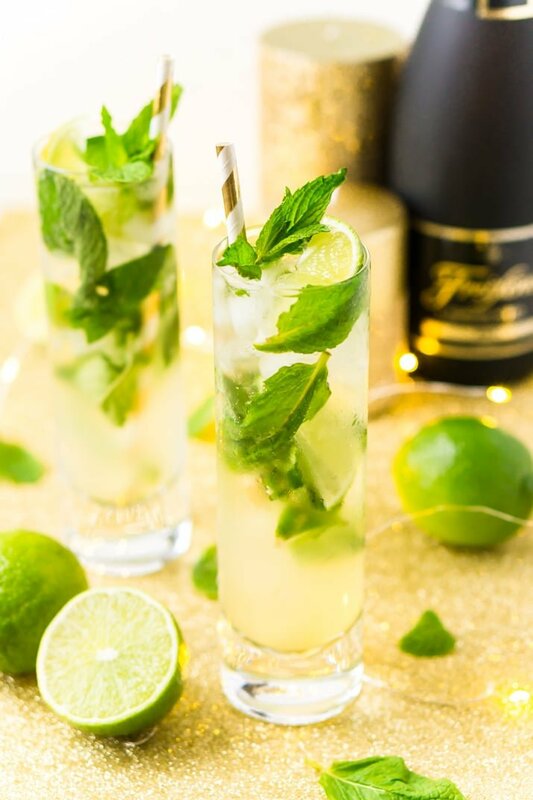 This Champagne Mojito will be an instant favorite when it comes to celebratory drinks! If you were to ask me what my favorite cocktail is of all the classics, I think I’d have to go with a mojito. I just love the pairing of vibrant limes and sweet mint served with lots of ice and a good jolt of rum and sugar. And once you add fizz, well, it’s game over in my book. I’ve never been a huge soda drinker, but I do love bubbly cocktails! 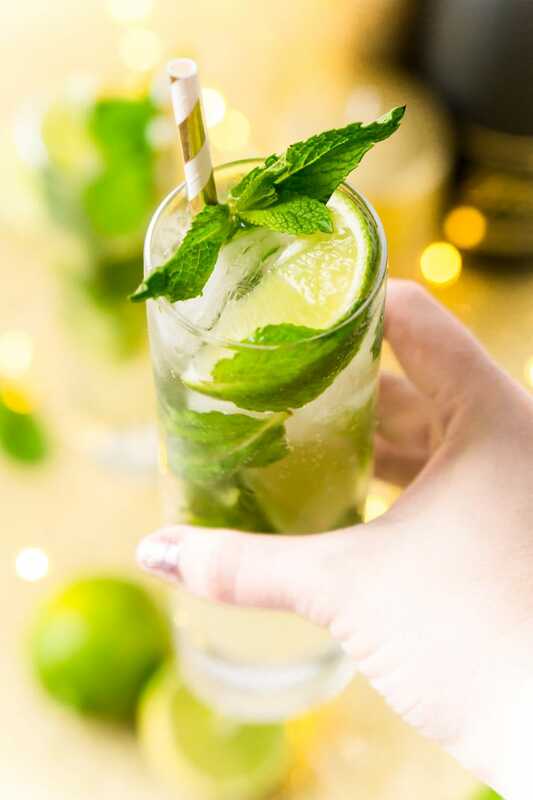 This Mojito recipe replaces the traditional club soda with champagne for a festive finish that’s perfect for New Year’s Eve, bridal showers, and any other celebration (or night in) your heart desires. Choose whichever Champagne, Cava, or Prosecco you prefer, it doesn’t have to be top shelf, but I highly recommend choosing something that’s at least over $10.00 per bottle. 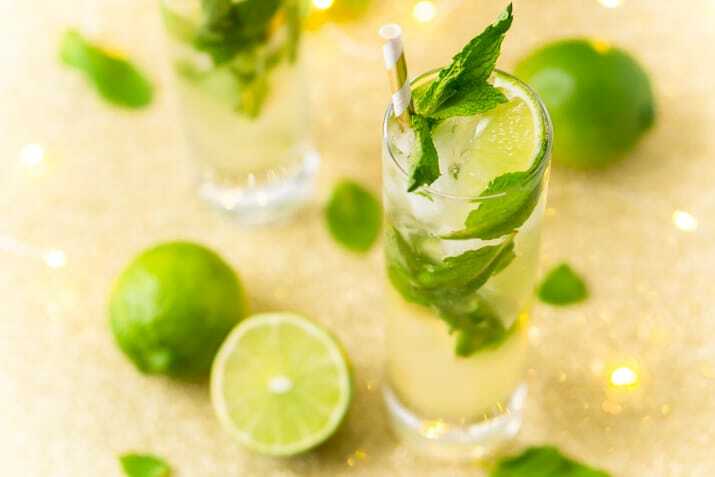 I love mojitos because they’re a little tart but not too sour and while they’re a pretty simple cocktail to make overall, there are some basic bartending skills that come into play. It’s all about the fresh ingredients, the muddling, the crushed ice, and the slapping. And let’s not forget the sugar! 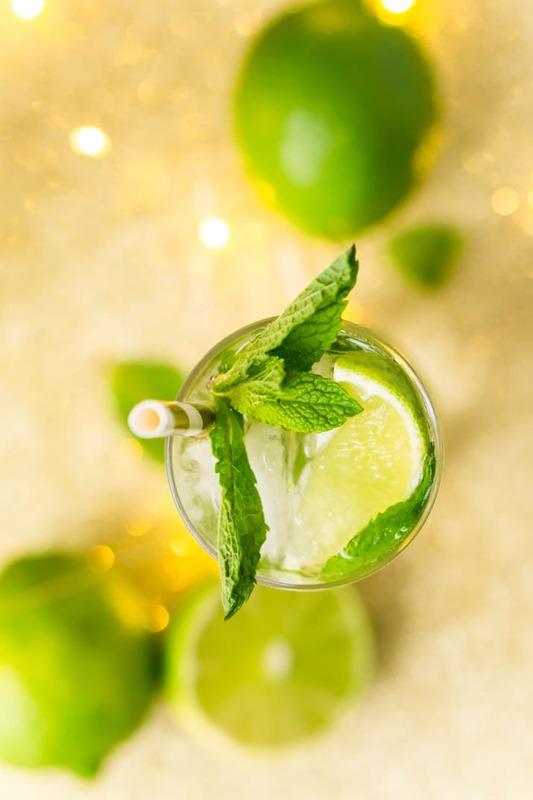 I’m sharing all the details below on how to make the perfect mojito, so just keep on scrolling for all the knowledge and I hope you have a wonderful New Year! Where did the Mojito originate? Although the exact origin is unknown, all signs point to Cuba! What kind of sweetener do you use in a Mojito? I personally like to use my homemade simple syrup because I think it blends the best. But traditionally, it’s made with superfine sugar like caster sugar. However, you do not want to use sugars with large granules, since they won’t dissolve very quickly and can make for an unpleasant cocktail. Some people like to use light brown sugar in their mojitos, but again, it may not dissolve. Muddling is the simple process of using a muddler to release the flavor and juices from fruits and herbs when making cocktails. How Do You Make A Mojito? In a highball glass, muddle together the lime and mint with the simple syrup (or sugar). Fill the glass almost all the way to the top with crushed ice (never cubes and never without ice). Add the rum and use a bar spoon to mix everything together. Fill the rest of the way with champagne (or club soda if you want a tradition mojito). Add a straw and slap a spring of mint between your hands to release the aroma and place right next to the straw, this way you’ll both smell and taste the drink when you take a sip. How do you make a Mexican Mojito? Follow the recipe and swap rum for tequila. How do you make a Virgin Mojito? This is drink actually makes for a super tasty mocktail, all you have to do is omit the rum and swap the champagne for club soda. Add additional soda to make up for the loss of rum. You can add extra lime juice or sugar to taste. Fill the glass almost all the way to the top with crushed ice. Add the rum and use a bar spoon to mix. Add a straw. Slap a spring of mint between your hands and place right next to the straw. 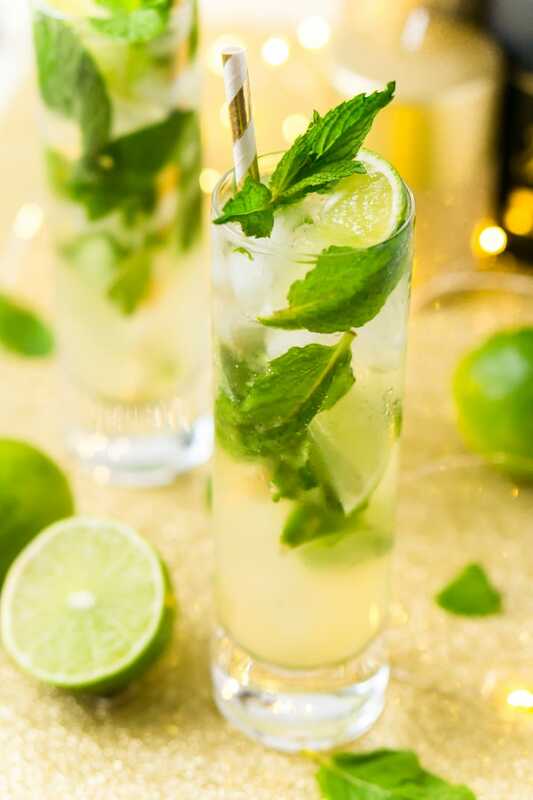 For a virgin mojito, omit the rum and replace the champagne with club soda. This looks so refreshing! And your photos are absolutely stunning. Thank you so much, Trang! This is such an amazing drink, can’t wait to make it for New Year’s Eve! I hope you get a chance to try it soon!